Join Colin on the CBS Early Show this Friday as he plans a Wedding In A Week.Whether you’re getting married, know someone who’s getting married, or been down the aisle already; you won’t want to miss this week-long wedding series packed with tips, ideas, and some of the latest wedding trends. On Friday, April 13: Meet the lucky couple and find out what’s planned. On Monday, April 16: Take a look at the latest fashions in wedding dresses, bridesmaid gowns, groom and groomsmen attire. On Tuesday, April 17: It’s off to H. Stern for engagement rings and a lesson on selecting stones. It’s not all about diamonds! On Wednesday, April 18: Table talk. Colin sets three beautiful tables for the wedding reception. Think young. Think fresh. Think chic! Thursday, April 19: Unbuckle your belt as we taste the food, select the wines and sample the cake. Friday, April 20: The I Do’s. It’s a live wedding ceremony on the Plaza at 59th and 5th. Then off to the Hudson Hotel to celebrate. It all happens first thing in the morning, but that won’t slow down the party! Monday, April 23: It’s a wrap. The party’s over and there’s only memories left. Just one final surprise you won’t want to miss. So stay tuned!! 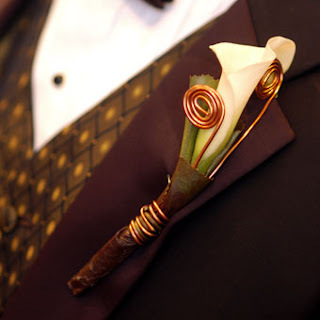 The groom’s boutonniere has come along way from the traditional red or white rose. Today we are seeing a more stylish piece for grooms two wear. In these two photos we see a sleek hydrangea & orchid boutonniere dressed up with colorful sea glass beads, and a hand crafted fiddlehead fern using copper wire and paired with a simple calla lily. 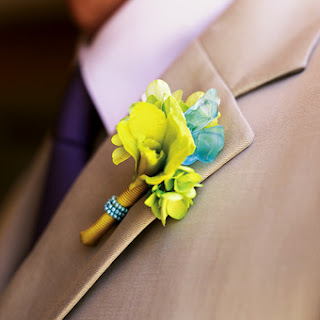 These boutonnieres add the ultimate finishing touch to the groom’s outfit as well as providing his own sense of style.